This small and lightweight range is a powerful alternative to electronic tools and ideal for a wide range of repair and installation jobs. The C14 weighs just 160 kg and is easy to transport in a van or delivery vehicle. A removable 20 liter petrol tank reduces the weight even more to 142 kg. 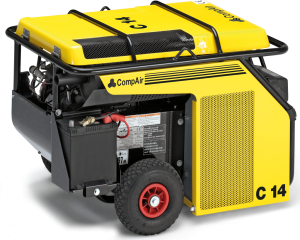 These compact compressors are equipped with a fuel-efficient, air-cooled petrol engine, type Honda GX 630V-Twin. This range offers the capability to run up to two breakers. The compressors are driven by quiet-running, energy efficient Kubota engines. With the benefit of a wide engine speed range, fuel savings are increased and the engine reliability and lifetime are enhanced. 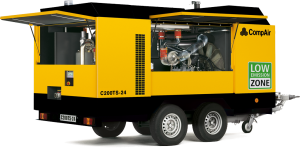 With an integrated generator, which can supply power for lights and electric tools, these portables compressors suit many applications. With an operating weight less than 500 kg (unbreaked) they can be towed by small vehicles. This popular range is very quiet which makes it suitable particularly for urban applications. Many rental companies use this range because of the versatile application capabilities and the easy operation. They are available in different chassis versions and with various options, such as integrated generator and after cooler. 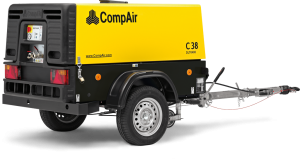 With a weight less than 750 kg (C38 and C42) these compressors are easy to transport. They are driven by a reliable, very quiet-running, water-cooled Yanmar 4-cylinder diesel engine with direct injection. Diesel particle filters can be retrofitted to existing models, allowing the use in emission-restricted areas. 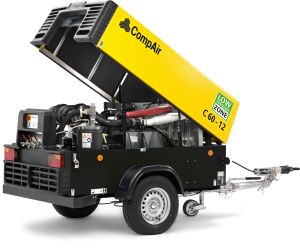 Designed for the toughest site conditions, whether it’s for road building, civil engineering or restoration work, this range offers outstanding reliability, performance and compressed air quality. The compressors are equipped with numerous features as standard, offering substantial cost savings to customers. Thanks to the inclusion of two batteries reliable running and performance can be also achieved in the coldest winter. 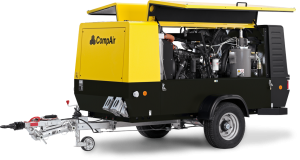 The durability of these compressors is further enhanced by additional engine management protection. The diesel engines are fitted with electronic fuel injection to meet the European emission standards. Diesel particle filters can be retrofitted to existing models, allowing the use in emission-restricted areas. The TurboScrew compressors with their unique bi-turbo technology provide class-leading diesel efficiency, the lowest weight of 3,500 kg and super-clean performance in accordance with EC directive 97/68/EG Stage 4 final. The TurboScrew includes the acknowledged SCRT® (Selective Catalytic Reduction Technology) exhaust after treatment system, including oxidation catalytic convertor and diesel particle filter (DPF). This system is capable of removing almost all of the nitrogen oxide emissions from the diesel exhaust gases. The patented bi-turbo technology achieves a 14% higher energy delivery to the compressor than conventional technologies. With average site conditions where the demand varies between idle, part load and full load, the TurboScrew consumes up to 30% less diesel than most of the conventional compressors on the market, resulting in significant cost savings.